CCI and Federal Premium are both brands of Vista Outdoor. Most CCI rimfire is produced in Idaho, while other Federal-branded rimfire ammo is produced in Federal’s Anoka, Minnesota facilities. Here we feature videos from both CCI and Federal ammo plants. Watch and learn how rimfire ammo is made. A reporter for Field & Stream recently got a chance to tour the Federal ammunition production facility in Anoka, Minnesota. This large plant produces both rimfire and centerfire ammunition. While touring the plant, the reporter was allowed to capture video showing the creation of .22 LR rounds from start to finish. This is a fascinating video, well worth watching. Note to Viewers — After Starting Video, Click Speaker Icon to HEAR audio! This revealing video shows all phases of .22 LR ammo production including cupping, drawing, annealing, washing, drying, head-stamping, priming, powder charging, bullet seating, crimping, waxing, inspection, and final packaging. We recommend you watch the video from start to finish. 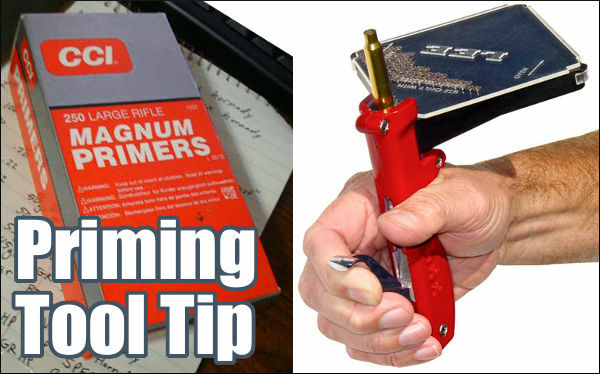 You’ll definitely learn some new things about rimfire ammo. Back in 2016, YouTuber 22Plinkster was able to tour the CCI Ammo plant in Lewiston, Idado. Here is the rimfire production video he produced. Shooting Sports USA explains: “Rimfire cartridge cases are the oldest self-contained cartridge in existence, having been in continuous production since the mid-1850s. Rimfire cases are drawn from a thin piece of brass and formed with a hollow rim. A priming compound is then forced into the case using centrifugal force, where it is charged with powder and a bullet is seated in the mouth of the case. The case is then crimped around the bullet to ensure sufficient push and pull when the round is fired. When the firing pin strikes the thin brass rim of the case, the hollow rim is crushed and the primer is ignited.” Source: SSUSA.org 9/2/2017. Share the post "How Rimfire Ammo is Made — Federal and CCI Videos Show All"
YouTube gun video producer .22 Plinkster has unbridled curiosity when it comes to .22 LR performance. A while back he wanted to see how many Christmas ornaments could be penetrated by one .22 LR round. To answer that burning question, Mr. Plinkster lined up 40 plastic Xmas bulbs in a row and then fired a single round of CCI .22 LR Velocitor ammo through the bunch, using his Henry Golden Boy lever action rifle. Did the bullet penetrate a dozen ornaments? Two dozen? What do you think? Watch the video to find out the surprising answer. The CCI Velocitor ammo is rated at 1435 fps. Christmas Ornament Penetration Test with Henry .22 LR Lever Action Rifle. Share the post "Christmas Rimfire Fun with .22 Plinkster"
Forum members have purchased this Caldwell Target Cam System and they’ve found that it works reliably, providing a clear signal to any WiFi-enabled mobile device (smartphone, iPad, Laptop). Amazon is offering this complete system for $313.99, with FREE shipping. One member specifically tested the unit at 1000 yards and it functioned fine. NOTE: This system does NOT have a zoom camera lens, so you need to position the camera within 10 yards or so of the target. But if you place it to the side a bit, this shouldn’t be a problem. NOTE: This system comes with a nice, fitted carrying case that holds camera, transceivers, antennas, and stands. EuroOptic.com bought a large quantity of Tikka T3 rifles from the North American distributor. Now these T3s are being offered at huge discounts –some well below wholesale cost. Tikka rifles that typically retail for $600 to $1000 are selling for $359 to $600. Save Hundreds! This is an amazing offer if you are looking for a very high-quality hunting rifle at a rock-bottom price. To add to the incentive, the first 500 T3 purchasers will receive a FREE Badlands Tenacity Backpack, a $45.00 value. Here’s a great deal on big-name, rimfire ammo. Right now you can get a 500-round pack of CCI Standard Velocity 40gr LRN ammo for just $24.99. That works out to just five cents ($0.05) per round. But it gets even better. If you purchase at least four 500-rd packs (2000 rounds total), you also get FREE shipping and a $10.00 discount with CODE JDC. With that “JDC” discount code, your total price is just $89.96 for 2000 rounds delivered, or 4.5 cents per round! That’s a great deal on reliable CCI ammo that’s good for plinking and rimfire cross-training. NOTE: If the JDC code has expired, try CODE MCP for free shipping on $49+ orders. Share the post "Bargain Finder 152: AccurateShooter’s Deals of the Week"
The .22 Long Rifle (.22 LR) round is widely regarded as a relatively weak cartridge with very little penetrating power. Compared to most centerfire ammo that’s certainly true. But the venerable .22 LR actually packs more punch than you might expect. A recent test by rimfire specialist 22Plinkster demonstrated that the little .22 LR has enough power to drive a bullet through multiple walls. In this video, 22Plinkster tests two types of .22 Long Rifle ammo, seeing how far a .22 LR bullet will pass through sheets of 1/2″-thick drywall. He shoots CCI Velocitor and CCI Stinger ammo types from both a pistol and a rifle. The results may surprise you. Shot from a pistol, the CCI Stinger ammo penetrated Nine (9) drywall sheets. Out of the rifle, the CCI Velocitor Ammo passed through Eleven (11) sheets, while the CCI Stinger stuck in the eleventh board, after passing through Ten (10) sheets. Share the post "Rimfire .22 LR Penetration Tests Yield Surprising Results"
Share the post "Rimfire Genesis — How CCI .22 LR Rimfire Ammo is Made"
Each week, Cabelas.com offers select Guns of the Week at special discounted prices. This week one choice is a special 200th Anniversary Remington 700 ADL with upgraded stock. This handsome rifle is $100.00 off, marked down to $549.99 from $649.99. The figured Walnut stock features deluxe Fleur de Lis checkering, plus a Commemorative grip cap. This special model 700 ADL with 24″ blued barrel is offered in three popular chamberings: .243 Winchester, .270 Winchester, and .30-06 Springfield. This Master Tumbler Kit contains everything you need to tumble rifle or pistol brass. Now on sale for $53.46 with free Prime shipping, this Kit contains: Vibratory Tumbler, Rotary Media Separator, Plastic Bucket, 3 lbs. Cleaning Media, and 4 oz. Brass Polish. NOTE: We considered this an excellent deal when it was priced at $67.99. At $53.46 it is a total steal — you could easily pay that much for a decent vibratory tumbler alone. This year Graf & Sons is celebrating its 60th year in business. To mark this milestone, Graf’s is having a series of big sales, with huge discounts (up to 60%), and some free product give-aways. This Tuesday, May 9th, Grafs.com will run a special 60 for 60 Flash Sale. This starts at 12:00 PM CT and has items up to 60% off, plus prizes including Free Ammo. An example of the great deals are Walker Ear Muffs at $4.99, 60% off the regular $11.99 price. NOTE: Flash Sale starts TUESDAY May 9, 2017. If you have been waiting to get a Magnetospeed… wait no longer. Priced at just $178.99 at Grafs.com, the Magnetospeed Sporter model costs less than half as much as Magnetospeed’s V3 models. This chronograph attaches directly to your barrel so you don’t have to go downrange to position tripods and set up skyscreens. For most people the Sporter Model contains all the features they need. Using Magnetospeed’s XFR adapter (sold separately), data can be transferred easily from the display module to your mobile device. READ Magnetospeed Sporter Review. Brownells also has the Magnetospeed Sporter at $179.99, and (for a limited time) you can get FREE Shipping with Brownells CODE “MAY”. 8. Sportsman’s Guide — CCI .22 LR Ammo, $3.49 per Box! This is versatile, affordable funnel system works with virtually all cartridge types, from 17 Remington up to 500 S&W. Even if you have a fancy metal funnel, its worth having one of these kits on your reloading bench. The RCBS Quick Change Powder Funnel Kit features five (5) adapters that match case mouth diameter for efficient loading: 17-20 caliber, 22-264 caliber, 27-284 caliber, 30-375 caliber, 40 caliber and higher. The Funnel Kit includes a handy 4-inch drop tube. Share the post "Bargain Finder 85: AccurateShooter’s Deals of the Week"